Cattle behaviorist Temple Grandin says the industry can address problems of mud, heat stress and cattle handling to improve cattle well-being in feedlots. by Troy Smith for Angus Productions Inc.
MANHATTAN, Kan. (May 20, 2010) — Closeout data is important to a cattle feeder, but Temple Grandin believes feedlot operators ought to be just as concerned about the public’s perception of cattle management practices. The Colorado State University professor and noted animal behaviorist addressed the International Symposium on Beef Cattle Welfare, hosted by Kansas State University in Manhattan, Kan., saying public perception will influence the future of the cattle feeding business. Temple Grandin says mud, heat stress and cattle handling issues are three areas feedlot managers need to address to improve consumer perception and cattle well-being. Grandin said people in New York City are learning what a confined animal feeding operation (CAFO) is. She called public perception increasingly negative, and beef industry efforts to counter misinformation have been largely unsuccessful. 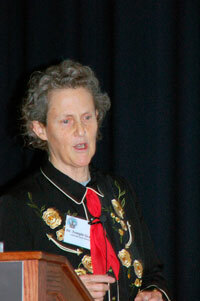 “We are not winning the communication battle,” Grandin declared. Often, Grandin explained, the public perceives feedlots as perpetually muddy quagmires. Mud is viewed as a huge animal welfare issue. She said muddy feedlot conditions, poor cattle handling practices and heat stress really are issues that most often compromise animal welfare. Managing heat stress is easier to address than mud, Grandin said. She noted how, in particularly hot climates, structures affording shade increase feedlot cattle comfort and performance. Cattle handling technique is the easiest fix of all, Grandin said, and often can be accomplished with the least expense. She advised managers to evaluate how facility design and maintenance affect cattle handling, and emphasized the importance of employee cattle handling methods. In addition to training employees in cattle handling methods, Grandin advised feedlot managers to make sure crews are staffed with adequate numbers of trained people and the scheduling of regular breaks during the workday to prevent employee fatigue. Grandin also advised regular maintenance of hydraulic squeeze-chutes and other equipment. Grandin urged feedlot managers to adopt auditing systems to evaluate core criteria — outcome-based measurement of factors for monitoring animal welfare. Criteria warranting measurement and analysis include death loss, sickness, heat stress, lameness, mud score and handling score.